Founded by Antoni Stojak in 2014, 100Strong represents a unique way to train – one that’s strategic, effective and refreshingly free of BS. We are based in Manly, just a block back from the famous South Steyne beach (in fact we’re tucked in behind the pub). With around 50 regular clients, 100Strong is a small, supportive fitness studio where there’s no negativity or ego. We’re all friends here! With over 10 years in the fitness industry and a Certificate IV in personal training under his belt, Antoni has gained a reputation for both his highly effective training approach, and his amiable nature. 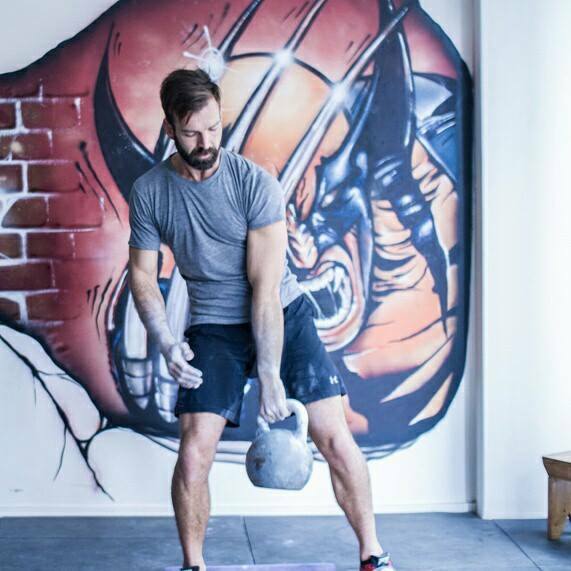 Always keen to explore new fitness techniques, Antoni became Australia’s first male Master of Kettlebell Sport in 2012, and it also the Australian record holder in Kettlebell Sport Biathlon. The techniques Antoni gained from this training have gone on to become the basis for most 100Strong programs, along with exercises inspired by martial arts and classic strength training. Passionate about health, nutrition and donuts (hey, everyone’s got a vice) Antoni loves training smart, focused people of all ages, and is mindful to tailor his approach to suit each individual. He also likes training to be fun – but be warned, this may involve dad jokes and Beiber karaoke! "I’m a bit like a Kelpie (sheep dog)…lots of energy and since I’m confined to an office 5 days a week, I need to led off some steam to reach equilibrium on a daily basis. 100Strong training is the perfect modality for me – a harmonious collision of physical/mental strength and endurance. " What do you like about 100Strong? "While my preference would always be for face-to-face coaching, I’m based in Canberra so I train long-distance – and Antoni has shown that this can really work. As a true coach should, Antoni gets to know and understand the individual he is training and prescribes programming accordingly. I sometimes travel to his Manly studio to train and have experienced the positive, relaxed but productive culture and training community he has established. " "Excluding Stojak maybe Ross Enamait or Ivan Denisov. " "I train because it makes me feel good about myself. I like the strength I gain and my physical changes. Also to stay youthful. " "100Strong kills it!!!!! We don't excercise we TRAIN! " "I wanted to be able to garden and stay active without worrying about back pain – and after training with Antoni for nine years, I can work in the garden all day and lift heavy objects, no problem. " "The atmosphere & the attention to detail given by Antoni to training using the correct methods. I thoroughly enjoy the sessions at 100 Strong. I find them stimulating and invigorating, and I leave each time with a sense of enthusiasm and achievement. " "My husband, who trains with me! " "After many years of playing basketball I had come to accept I would never be able to do any form of running or strenuous exercise due to the degradation of my knees. Antoni has helped me to build muscle and I can now squat with weighted barbells. My body looks toned and my family thinks I look great. My posture has also benefited tremendously. Now I’m I'm feeling healthy and my body is responding with additional muscle tone. " "Personal attention small group, no more than 5 other people in the group. I am pushed to move beyond my limiting beliefs. Antoni is quirky and witty and I can see he gets great pleasure in seeing me work to higher outcomes. " "To have a killer bod for summer! Since I’ve started training with Antoni I can feel my body responding to the exercise, creating a tighter physique that I'm proud of. " "I love the chilled vibe! I can go in knowing I am going to have a good time. " "There’s often a cool group of girls that train together, we have a lot of fun. It’s nice to train with my mum too – good mother/daughter quality time! " "I have been passionate about sports most of my life. In the last 10 years I competed in swimming, running and extreme challenge competitions. I later became obsessed with martial arts and got my black belt in Muay Thai last year. " "I always learned from the best and was fortunate to meet Antoni a year ago and became involved into Kettlebell sport. His achievements speak for themselves and I am proud to have Australia's first Kettlebell Master of Sport as my strength and conditioning coach. His approach and training techniques are refined and personalised, it made me noticeably stronger, faster and leaner. I would highly recommend 100Strong and Antoni as a fitness coach to people who want real results fast. "